The unfortunate and sad ban of the sale of foie gras in California went into effect yesterday, and before that happened, Nick purchased a foie gras liver from Hudson Valley Foie Gras in New York, so he could make a few special dishes with it. Lucky girl that I am, he decided to make ALL the dishes together in an out-of-this-world tasting menu for my special dinner this month! The first of the five was a Foie Gras Mousse on Brioche, which was a nod to Thomas Keller’s “Blueberry Swirl” dish that we had the pleasure of tasting when we ate at the French Laundry earlier this year. 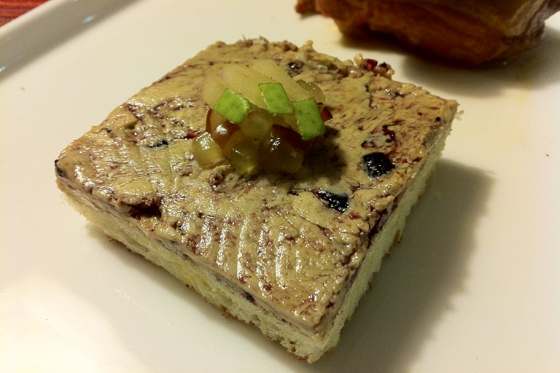 Nick incorporated the blueberry preserves into the foie mousse he made, and garnished the toast with diced grapes and apple slivers. This was fresh, smoky, sweet, rich, and delicious. 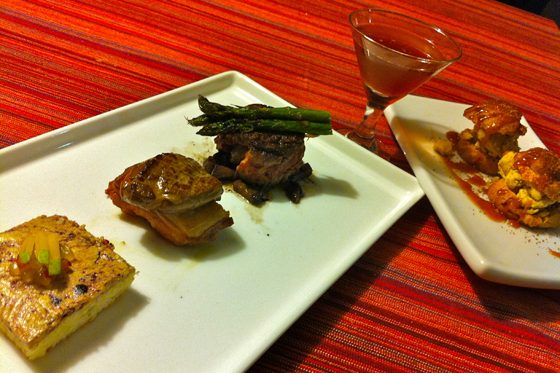 He also prepared Pan-Roasted Duck Breast topped with a Foie Gras Medallion. 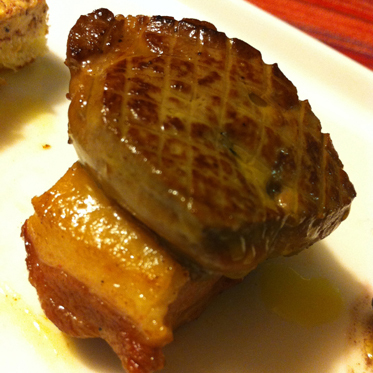 The crispy skin, the hearty duck meat, and the silky foie gras made for a fantastic flavor and texture combination. 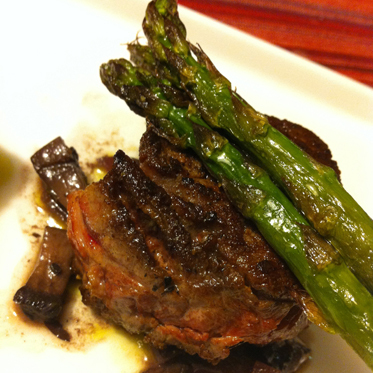 As if things couldn’t get gourmet enough, he also prepared a Foie-Gras Stuffed, Pan-Seared Filet Mignon, accompanied by sautéed mushrooms and roasted asparagus. What can I say? This was just outstanding. To compliment this foie fantasy, he also made me a “Foie Gras Washed Bourbon”, which he did by rendering some foie gras, straining the delicious fat, pouring it into a bottle of some very nice bourbon, putting the whole thing in the freezer, and letting it steep overnight. The next day he strained the bourbon twice, and we ended up with the most luxurious bourbon in the Universe. The foie adds a sweet, almost creamy, vanilla-like component to the bourbon that just rounds and smooths it out so beautifully. I LOVE this stuff! 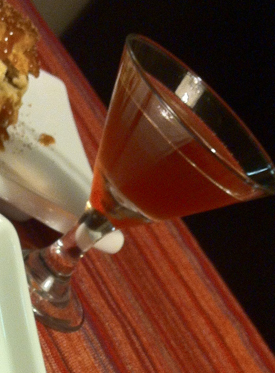 I made a special cocktail of my own with it, another nod to Thomas Keller’s Blueberry Swirl. 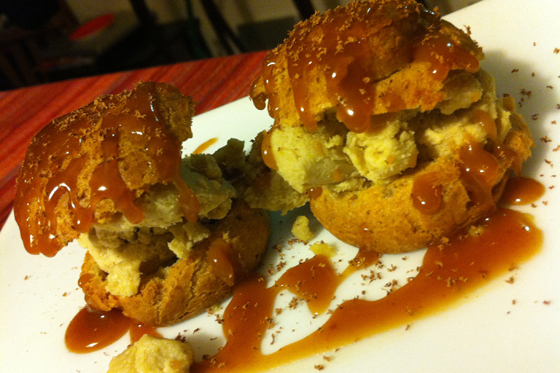 And yes, this post is labeled, “Foie FIVE Ways” – and what gourmet dinner is complete without dessert? Yes, duck liver dessert. Nick and I got a chance to go to Portland’s fantastic LePigeon when we went on our trip with Laurie, and Nick borrowed their awesome recipe for Foie Gras Profiteroles, stuffed with Foie Gras Ice Cream, drizzled with Salted Foie Gras Caramel. Airy, creamy, silky, velvety bites of heaven. Thank you for my very special gourmet dinner, Honey! You have seriously outdone yourself. This was absolutely spectacular!